For the first time in its near-decade existence, the boys’ edition of the South Sound Relays were not held at The Evergreen State College. 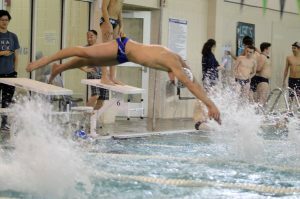 Instead this year’s event took place at the Rogers High School aquatic center in Puyallup – a facility that is considerably larger than the pool at Evergreen. With nearly 45 athletes – a number that represents one of the largest turnouts ever for the team – the added space proved extremely valuable for Olympia High School’s sizeable roster. Since the meet’s inception, the Bears have made it a common practice to line the edge of the pool when one of their own competes, loudly cheering on their teammates through every stroke. Despite being a tight squeeze, the extra real estate was much appreciated for the Bears as they crammed into every available inch they were given to continue their spirited tradition. As it turned out, the squad definitely had plenty of things to cheer about as Olympia claimed the overall team championship after winning 6 out of the 11 events at the Ninth Annual South Sound Relays on January 5. The Bears finished the event with 930 total team points to easily secure the team title. Puyallup was a distant second with 786 points, while Steilacoom was third with 692. Emerald Ridge (674 points), Tahoma (671), Rogers (570), Shelton (489), Lakes (394), and Aberdeen (351) completed the order of finish among the nine competing schools. Olympia was simply dominant throughout, finishing among the top three in 10 out of the 11 events with a trio of second-place finishes to go along with its half-dozen triumphs. 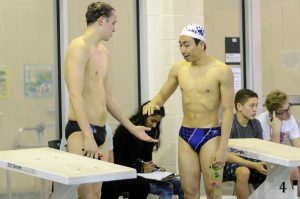 The Bears wasted little time taking over the top spot in the standings with the team of Brett Wilson, Jordan Kamimura, Tony Ponomarev, and Andrew Liu winning the 400-yard medley relay in a meet record time of 3 minutes, 44.24 seconds. While Kamimura, a senior, and Liu, a junior, are both captains and have been on the team since they were freshman, Ponomarev and Wilson are both newcomers with the latter a freshman and the former a senior who is returning to the team following a two-year hiatus. 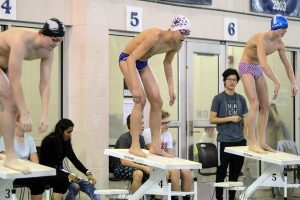 Both put their stamp on this year’s South Sound Relays, teaming up to win a pair of two-man relay races as well as helping the Bears’ 400 medley and 400 freestyle relay teams take home first-place medals. Ponomarev and Wilson won the 2×100 freestyle (1:39.89) and the 2×100 backstroke (1:48.89), and later joined Liu and Adam Skjervold to pick up a victory in the 400 freestyle – an event last year where the team of Liu, Skjervold, Alex Wright, and Everett Werner broke a near 40-year old school record at the 2018 state meet. Wright and Werner are now both swimming in the Atlantic Coast Conference with Wright a member of the Virginia Tech team and Werner competing at Duke. Most programs would suffer greatly after graduating two D-1 athletes. The Bears, however, haven’t missed a beat it seems with Ponomarev and Wilson coming aboard. 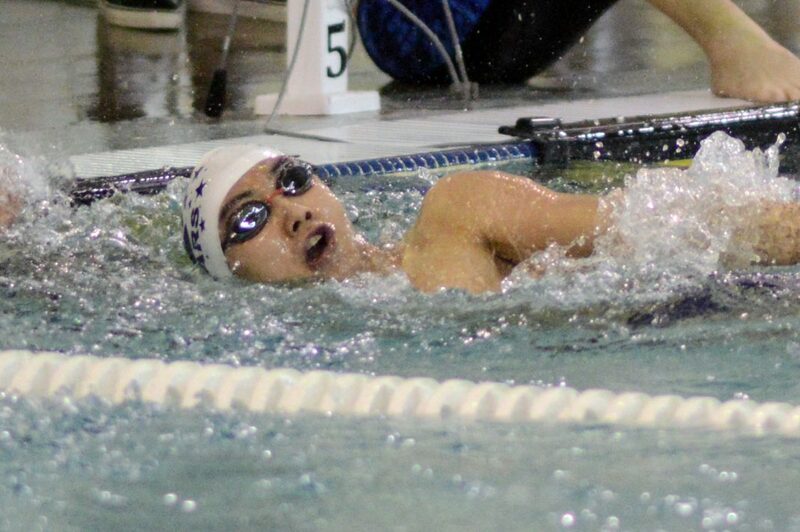 Kamimura teamed up with another one of Olympia’s gifted freshman, Lucas Qui, to win the 2×100 breaststroke relay in a time of 2:15.30. The Bears also won the 800 freestyle relay after the team of Jake Seabaugh, Roman Burrows, Hunter Pitzler, and Ryan McIntosh stopped the clock in 8:24.57. Olympia also received a second place in the 2×100 medley/2×100 IM relay from Kamimura and Liu (159.69) and a runner-up performance in the 2×200 freestyle relay (4:10.23) by senior Pitzler and freshman Burrows.